I repeat myself a lot, but I forget a lot, too, and I mostly write for myself. I walk to school every day. I watch the shadows shift across Liberty Street as the seasons change. There are not that many activities anymore where adults matter anymore. Baseball is about failure and fear and sunlight and the cerebellum (muscle memory). It gives you what you give it, not a small thing in these days of steroids and hype. But that's not why I am writing about Little League. Bloomfield is blessed with mulberry trees. They grow quickly and produce a ton of fruit. The big purple splotches you see along the Garden State Parkway in June are smushed mulberries. I taught a few kids how to hit, but more importantly, I showed them you can eat fruit off trees in our town. I also munched on dandelions during practice, but discouraged this among the ball players since some people insist on trying to kill them with noxious chemicals. Most of my players will no longer be playing ball by the time they hit high school. I doubt they'll be eating mulberries in high school , either, but eventually they will. Once you have stripped a berry off an urban tree and eaten it, staining your fingers and lips purple, your universe has changed. Mothers, avoid coaches with stained purple lips. And what do we do in school? Do we teach evolution, that perhaps humans were not inevitable? Do we teach about death and injustice? Do we dare comment on capitalism or Christendom or unsustainable living? In the end, really, no need. There's no room for preaching in school. There is room, though, for a mulberry. Once a child's hands are stained with mulberry juice, once a child savors grace, anything is possible. 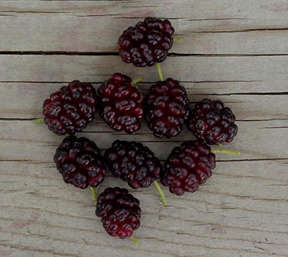 The mulberry fruits were taken from Purdue--go Boilermakers! Ah but the found berries - the wild strawberries on a walk in the woods, the wild raspberries in a local park - are the best! When I eat them with my kids, I walk them through the identification steps and then make them justify their conclusion on future expeditions. Most of them aren't easily mistaken for something poisonous and kids need to know the value of their world. I am delighted with my son's Little League coach this year, but I'd also be delighted with a coach with stained purple lips. My sons and I just made home-made spaghetti sauce. The carrots were from one of our friends, the tomatoes from another. We had the thyme, oregano, basil and sage in our front yard. We added squash and onion that we had planted in the backyard. When we were done, Joel said, "So this is why God is good." He's right. We worked for none of it. A tangible expression of grace. I don't want to get too religious here, but I'll continue anyway. I asked my sons why God created plants. Their list included: oxygen, medicine, shade, beauty, food (Micah's one answer) and "for fun." I asked Joel about the last one and he explained, "Dandellions are fun to blow and trees are fun to climb and oranges are fun to smash." I'm struck by how different church would really be if people took Jesus' advice to "consider the lilies." Your kids are a step ahead of most--too many parents insist that berries are deadly. You are right, most of them are easily identifiable. Even if you make a boo boo, we're gifted with taste budds; taste/smell is underrated. If you like your coach, let him (or her) know. Think how different organized Christian religions would be if people actually paid attention to His words. Maybe every June service should start with foraging locally. Thanks for the link--only reader I truly need is you.